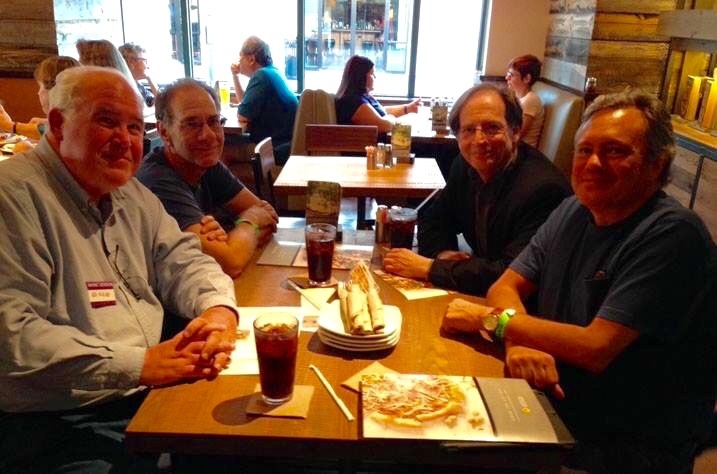 (L to R) Ed Hulse, Mark Trost, Jerry Beck, and Rick Scheckman. By James H. Burns: Back in the mid-to-late 1970s, often in the film rooms of conventions in New York, you’d see Mark Trost and Jerry Beck running the film shows, manning the projector. (Future filmmaker Mark Heller was also often a part of the mix!) The gentlemen were part of the terrific group that helped make the Creation Conventions, run by Gary Berman and Adam Malin, and one or two of Phil Seuling’s annual International Comic Art Convention so much fun, and memorable. They were also all members of the Film Co-Op, an almost secret movie society that met in mid-town Manhattan. In the late 1960s, Chris Steinbrunner, John Cocchi and Joe Judice transformed the basement of a nondescript building in a rather dangerous looking neighborhood in the heart of Hell’s Kitchen, into a fully functional, small MOVIE THEATRE. And Ed Hulse and Rick Scheckman were also part of that lively mix (and, no doubt, also probably helped with some of the convention film shows). Last night they had a reunion of sorts, in Hunt Valley, Maryland, at the Mid Atlantic Nostalgic Convention. All of the gentlemen have had lovely careers. Mark Trost co-founded Streamline Films (with Heller), and now runs the astonishing Film Archives Inc. stock footage service, on his own (and has also written extensively on movies, and film history). Jerry Beck has become one of the leading animation historians in the country, as well as an animation producer. Rick Scheckman was one of the key behind-the-scenes personnel for the ENTIRE RUN of David Letterman’s late night talk show. Ed Hulse has been a distinguished writer about media, and is a top pulp historian, and the publisher/editor at Murania Press. This entry was posted in Conventions and tagged Ed Hulse, James H. Burns, Jerry Beck, Mark Trost, Rick Scheckman by Mike Glyer. Bookmark the permalink.